Restore your mobility and flexibility with the help of intersegmental traction, offered at Pray Chiropractic. 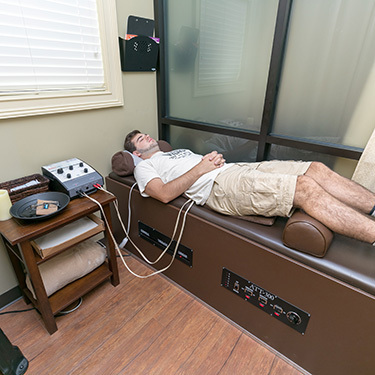 We provide several options to help you heal and get out of pain. Intersegmental traction addresses your entire spine and feels like a relaxing massage. As it helps your condition improve, you’ll feel reduced pain, greater joint flexibility and be able to better maintain your chiropractic adjustments. It’s even appropriate for pregnant women, who love the feeling they get from the stretching of their spinal joints. You’ll lie on a bench-style table that has rollers beneath the surface. Slowly, the rollers go up and down the spine, exercising it without you having to put in any effort. The discs of the spine, which have poor blood supply, receive nutrients when the fluids are circulated. Left untreated, a fixation in the spine leads to disc degeneration. Intersegmental traction in Dalton and Ringgold will help restore the motion and elasticity to your spine. Contact us today to arrange your appointment! We’re in-network providers with many area insurance plans.